Before becoming known worldwide as the notorious penitentiary and, more recently, a famous tourist attraction, the little island of Alcatraz in the middle of San Francisco Bay was controlled by the U.S. Army for nearly 90 years. This barren, guano-covered island surrounded by treacherous currents was ideally located to serve its dual purposes as military defense post and prison. John A. Martini is a native Californian and a life-long researcher into the history of the American West. A fourth generation San Franciscan, John graduated from Saint Ignatius High School in the City then attended the University of Southern California, U.C. Berkeley and San Francisco State University. 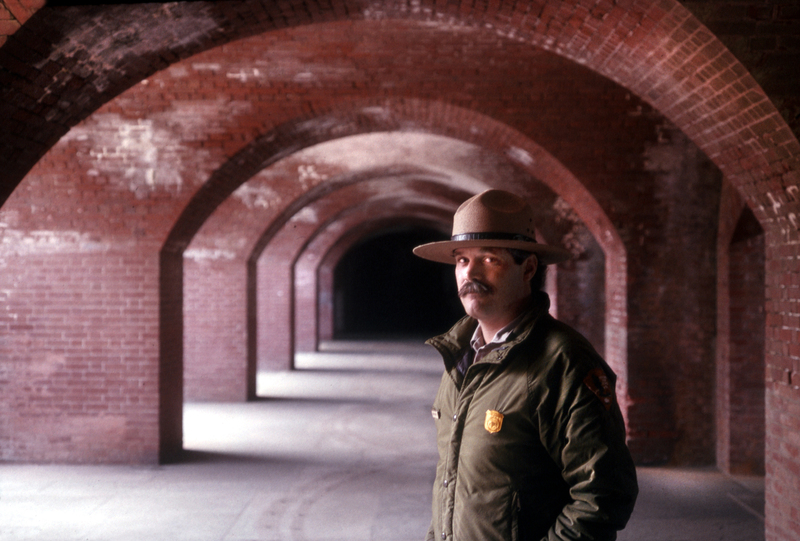 He worked as a National Park Ranger for more than twenty-five years at such diverse location as Fort Point National Historic Site, Alcatraz Island, the National Maritime Museum, the USS Arizona Memorial, the Presidio of San Francisco, and Teddy Roosevelt’s estate at Sagamore Hill National Historic Site. For many years John was stationed at the Marin Headlands District of the Golden Gate National Recreation Area where he served as a Supervisory Park Ranger for Interpreta-tion and Law Enforcement. His completed his long career with the National Park Service at the Presidio of San Francisco where he served as Curator of Military History. He now works as an independent historian / consultant specializing in historical research, interpretation and preserving cultural resources. John’s specialty is historic preservation. In the late 1970s he supervised the acquisition and restoration of a 1903 “disappearing rifle” from the Smithsonian Institution. He participated in the pioneering archeological surveys of the sunken battleship USS ARIZONA in Pearl Harbor and “dry land” explorations of Sutro Heights, the Presidio and Fort Mason in San Francisco. He also coordinated preservation projects such as the restoration of a 1950s Nike missile site and the conversion of an abandoned military chapel into an award-winning Visitor Center for the Marin Headlands. In the course of his work as a Park Ranger and researcher John has carried out dozens of oral history taping sessions preserving the words and memories of people spanning the historic spectrum from Alcatraz guards and convicts, to Japanese pilots who participated in the attack on Pearl Harbor. He is also an acknowledged expert on America’s coastal defenses and consults with numerous state and federal agencies on the preservation, restoration and interpretation of seacoast fortifica-tions and artillery. In addition, John is recognized as the leading expert on Alcatraz Island during the years it served as a fortress and an army Disciplinary Barracks. He is currently working with the National Park Service in preparing a series of Historic Structure Reports detailing the histories of every building remaining on the island, as well as a definitive Furnishings Report for the main prison building. John’s published works include Fort Point: Sentry at the Golden Gate; Fortress Alcatraz; The Official Guide to the Presidio of San Francisco; and Alcatraz At War. His articles have appeared in American Heritage, The Civil War Chronicles, After the Battle Magazine, and the National Archives’ quarterly journal Prologue, and numerous military history magazines and journals. He is a widely quoted authority on military and San Francisco history, and appears frequently on television on The History Channel, A&E Network, The Discovery Channel, and specials produced by PBS affiliates. American Seacoast Defenses: A Reference Guide. (Contributing author) Houston, Texas: Coastal Defense Study Group Press, 1999. Fortress Alcatraz. Kailua, Hawaii: Pacific Monograph, 1991. “J.D. Givens: A Personal and Professional Biography.” Prologue: Quarterly Magazine of the National Archives and Records Administration. Summer 2002. “Survivor of the Plan of 1870: Battery Cavallo, Fort Baker.” Coastal Defense Study Group Journal. February 2000. “Search and Destroy: The 1864 Alcatraz Photographs.” The Civil War Chronicles, pp. 24 – 29, Winter Issue 1994. “Search and Destroy: The 1864 Alcatraz Photographs.” American Heritage Magazine, pp. 98 – 103, November 1992. “Surveying the Battleship ARIZONA.” After the Battle Magazine, pp. 39 – 43, Issue No. 45, Fall 1984. “Diving Into History.” Pearl Harbor-Gram, Fall Issue 1982. Abbreviated Historic Structure Report: Fort Barry Balloon Hangar: (With Jane Lehman, NPS). “What We Have We Shall Defend”: A Historic Resource Study and Preservation Guide for Nike Missile Launch Site SF-88L, Fort Barry. (With Stephen A. Haller) San Francisco: National Park Service, September 1998. Save The Rock: The Alcatraz Preservation Project. (Author) Interpretive brochure. San Francisco: Golden Gate National Parks Conservancy. 2003. Alcatraz Cellhouse Audio Tour. (Advising historian and Interpretive specialist.) Self-guided audio tour. San Francisco: Golden Gate National Parks Association. 1987.